Check out this article at WoWInsider: Wouldn’t It Be Cool?, Matt McCurley spins a tale of how possibly the Shadow Council corrupt the brash and emboldened War Chief with their warlockery ways which eventually leads to his fall. Really? OMG, I hope this is not the case. Once again Blizzard would put the Warlock class into the stereo-typical “Bad Guys” who try to ruin everything just because we are “evil incarnate”. No offense Matt, but Garrosh is on his way out because of his leadership and his actions not because of corruption from ‘locks. Trust me, as a Warlock we don’t look for failed leaders like him to join our ranks or even to try to control. Especially not one like Garrosh! We look for influential people with lots of potential. Think Kil’Jaedon, Archimonde or even Kel’Thuzad. Dear goodness I hope people don’t believe this tin-foil hat theory that Warlocks are the doom of Garrosh and I sure hope Blizz doesn’t follow that line of reasoning as well. Garrosh is a flawed character and a bad leader who makes bad choices because he is a flawed character. 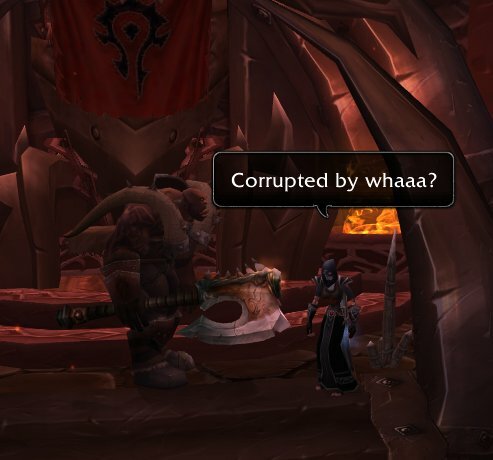 I think that is much more interesting than having been corrupted by an outside force like a bunch of warlocks. If this comes to pass I might have to give up playing WoW. Really. Blame it all on warlocks! Bah! Here is a better story line. The idiot Garrosh with his never-ending ego for honor & glory and to face his “Daddy Issues” forces the Warlocks to somehow bring back Mannoroth’s blood for him to drink while also trying to bring back the Burning Legionne. Since we all know even a mediocre warlock could probably take this fool out either with something as simple as using their wand or even a couple of Fel-flames, Garrosh will have to have a major edge or bargaining chip to force a grand order of Warlocks to do this task. I have no idea what that bargaining chip would be but it would have to be big. Please Blizzard, there are talented people in your offices who I know can come up with good ideas. If I read another story line where someone starts off good then gets corrupted by an outside force I’m going to go crazy, especially if it involves Warlocks who are doing the corrupting. How many times have we seen that story line get played out in WoW? Anne Stuckney at WoWInsider discussed on the All Things Azeroth Podcast about a character Lilian Voss. Lilian Voss is a character you come to meet and know in the Undead starting zone that follows through several story arcs. Anne laments about how Blizzard has a habit of setting up great ideas for a character’s development and plotlines but instead of expanding on those ideas they fall back on the same old tired story lines that are flat, boring and repetitive. Maybe I’m jumping the gun on Mr. McCurley’s Tinfoil-hat theory. Maybe I’m getting Silver-Thread Tmog set in a bunch about nothing at all. I can only hope so.